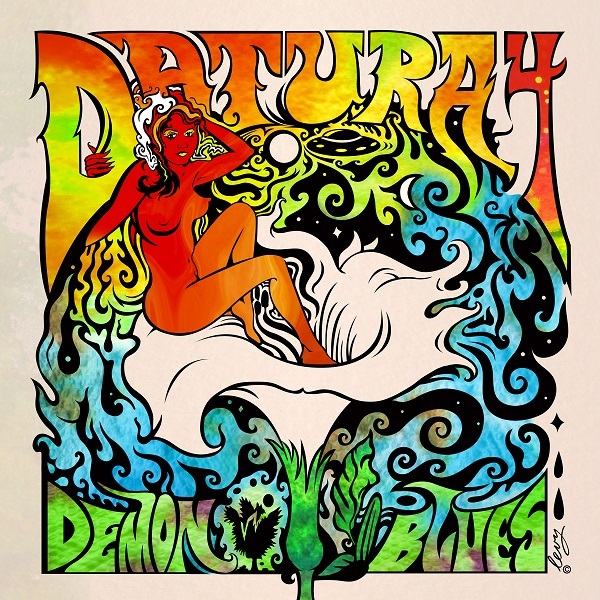 Here is a new band from Down Under, Datura 4, who play a mixture of psych, prog, and blues rock reminiscent of the 70s. The band is Dom Mariani (vocals, guitar), Greg Hitchcock (guitar), Warren Hall (drums), and Stu Loasby (bass). Coming together in 2011, Demon Blues is their debut release, and quite an interesting one at that. The opening track, “Out with the Tide,” is a psych hard rock number with a sound similar to Paul Kantner and possibly Jorma Kaukonen. There are some killer riffs peppered throughout the disc, as well as some inventive guitar breaks. I particularly enjoyed “You Ain’t No Friend of Mine,” “Journey Home,” and the title track. “Another Planet” bears a strange resemblance to Norman Greenbaum’s “Spirit in the Sky.” And a couple of the other songs reminded me of the Brit psych rockers Dead Flowers. Then of course when Datura 4 kick it into hard rock territory, like on “Hoonsville,” they channel ZZ Top. The cover art has a demonic motif mixed with psychedelic imagery, but it doesn’t seem to capture the essence of the music. But, if you really dig heavy blues, garage, progressive rock with psychedelic overtones, then you need to grab a copy of this new release.